Few get them. Most candidates get an Offer of Appointment without an LOA. Don’t think too much about it, but if you get one, cheer. The B&G (Blue and Gold) Interview is by your BGO. It allows the Naval Academy one more opportunity to ensure that they appoint candidates who will make it through the next nine years. It has to occur before you are accepted and shows up as complete or pending on the CIS. Prepare for it. Don’t take it for granted because you think your BGO ‘likes’ you. It’s his/her job to be an applicant screen for USNA, not your buddy. Frosh/Soph: To find your Blue and Gold Officer Area Coordinator, please click here. Even if you’ve already received your offer, attend this exciting weekend. You’ll get to see the Yard, visit Mids, ask more questions, see how the academics work. It’ll help you decide if you’re not sure, or clinch your decision to attend. This should be done by now. If you required a DodMETS waiver, follow up. Make sure it comes through. A good rule is to do everything you can until the ball is in someone else’s court so to speak. Don’t expect a waiver to happen without lots of personal attention. Click here for background on DodMETS. If you didn’t pass CFA during Summer Seminar or didn’t attend that event, arrange for your high school gym coach or someone else you trust to administer the full exam. If you don’t pass, you have until you submit your application to pass it. Check out what’s required (crunches, shuttle run, mile run, etc.) and make sure you’re prepared. Check the binder you set up over the summer to be sure everything is submitted. Check CIS–Candidate Information System–the online application site for candidates only. Be sure USNA has everything you’ve sent. If they don’t, resend and/or talk to your B&G Officer. In fact, stay in close touch with your B&G Officer at this stage in your process. He’ll be interviewing you and passing his recommendation on to the Admittance board. Depending upon the Congressperson, it may be too late to apply for this interview. These are due in Fall with interviews in November/December. Get one from your Congresspeople–including both Senators. Fill them out. Double check to see that everything is accurate. Handcarry it to your Congressperson’s office. When you drop it off, try to meet the aide responsible for this activity. Say hi, chat for a moment. S/he may remember you from the Academy Night, and will definitely remember you when you come in for the interview in November/December. 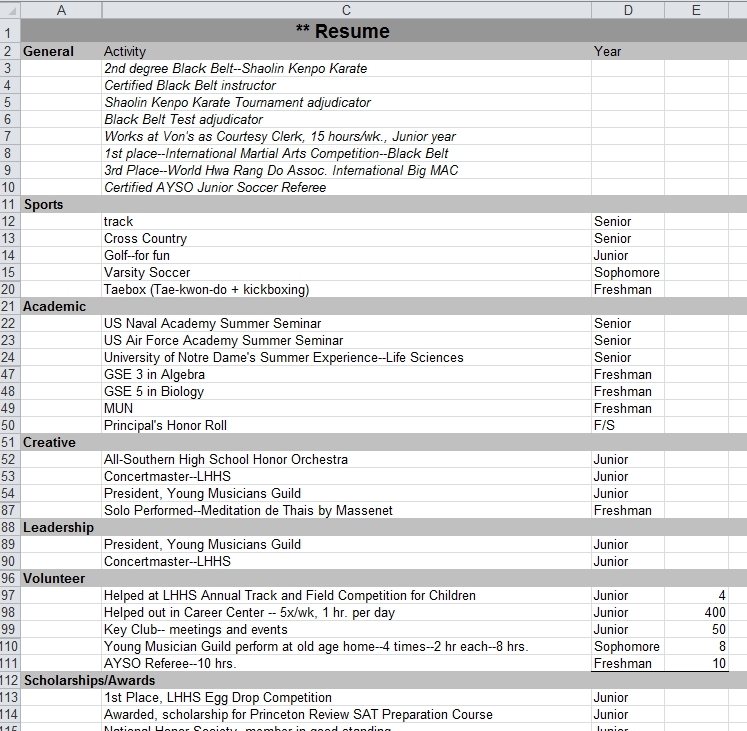 List all of your activities, awards, community service. The best time to start this is as a freshman. Keep it up to date throughout high school. It’ll remind you of all your accomplishments when you’re filling out applications and essays. You must have one to apply to the Naval Academy. These tours are offered through your Blue and Gold Officer or any number of other avenues. Find a tour. Take it. You want to be sure the Naval Academy is right for you. Seeing officers at work on a Navy ship is a good idea.